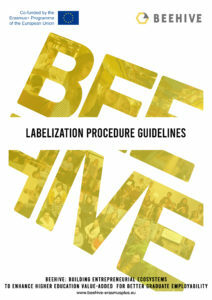 The BEEHIVE Labelization Procedure Guidelines were prepared in the framework of Work Package 6 of the BEEHIVE project. The BEEHIVE Label was created with the aim to empower higher education institutions in Indonesia and the Philippines to transform gradually into entrepreneurial universities by obtaining a specific quality label certifying the excellence and efficiency of their university entrepreneurial ecosystems. The BEEHIVE Label is based on the well-known certification scheme whereby the applying universities in Indonesia and the Philippine go through an external auditing procedure. The latter uses evidence of self-assessment and self-reflection collated and collected from the targeted universities.